SmithHouse had opened a scant 5 days prior to this review, and I liked the idea of getting there first to review their burger. I imagined that they would have worked out the service kinks over the weekend. SmithHouse was a pub-style joint with lots of brick work and rustic touches, throughout. The tap wall was impressive with about 120 beers. There was also a full bar. Valet parking was free and very convenient. I attempted to get some information about the burger from my server, and I quickly learned that the front-of-house staff had not been clued in by the kitchen as to the components of the burgers. This was odd, since burgers comprised 25% of the menu. A member of the kitchen staff was summoned, and I learned a little more. Very little...much about the burgers at SmithHouse was kept secret....so it goes. I dutifully ordered the SmithHouse Burger, as suggested by the member of the kitchen staff with whom I spoke. Since no one could or would share the cuts of beef with me, I went with the safe choice of a Medium cooking temperature. My burger arrived in about 10 minutes. The Beef: The bespoke beef blend was derived from Vintage cattle. Vintage cattle are like heirloom produce. The beef tasted heavily of dry aging as it was most heavy on the funk. In fact, it was funky enough to mask most other flavors associated with the beef component of a cheeseburger. It was a 30% fat blend, so it was greasy enough to cause a little stomach discomfort on the ride home. The blend tasted like Brisket, Sirloin, and Short Rib, but I was only guessing. The blend was pre-ground to medium coarse and delivered to SmithHouse. The bite was decidedly steaky and firm in texture. There was a fair amount of blood, but that oppressive funk obscured any minerality that would have come from the blood. 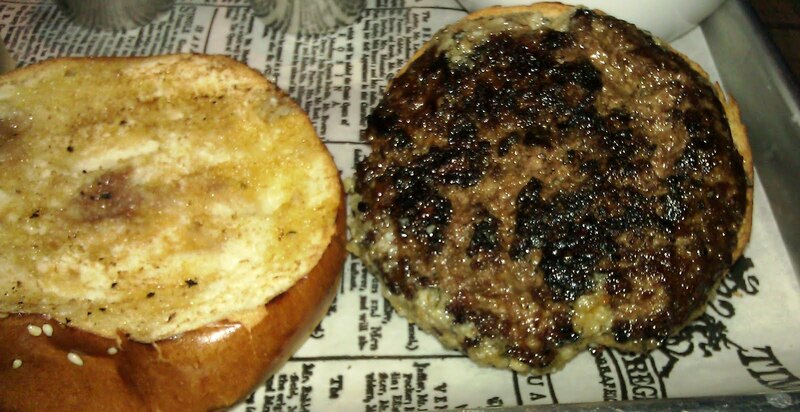 The Seasoning: The exterior of the thickish, 7-ounce burger patty was salted as it cooked...heavily salted. That seasoning, coupled with the marrow/Parmesan spread, which topped the burger, delivered an explosively and excessively salty bite. It was salty enough to make the roof of my mouth itch. This was not the sort of burger that I could get more than half of down. 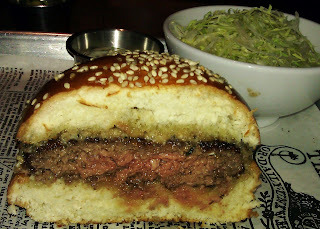 The Sear: SmithHouse seared the heck out of that burger. By "seared" I really meant "charred." SmithHouse delivered a charred burger. The sear was crisp and deep, but it was also bitter since the surface was blackened with shiny carbon. The Preparation: The mysterious blend of Vintage ground beef was hand-formed during morning prep at SmithHouse. The 7-ounce, hand-formed patties were created with just the right pressure to deliver a firm and juicy mouth feel. I ordered Medium, and I got a competent Medium. It appeared that the burger had been grilled and then finished (immolated) under a broiler. The Cheese: I could have gone with Cheddar, but I followed the chef's recommendation and ordered my burger with the marrow/Parmesan spread. MISTAKE! While the marrow was rich, hearty, and decadent, this spread was overwhelmingly and unpleasantly salty. The Bun: The seeded brioche was prepared specifically and solely for Smith House by an un-named vendor. Honestly, I wouldn't have wanted to be named as the baker that provided that bun. The bun was DRY. The bun carried a sweetness somewhere between a doughnut and a scone. The bun was mealy almost to the point of grittiness. The bun was very rich. Additionally, the bun was heavily buttered and under-toasted. I resorted to eating the burger without the bun, but without the cloying sweetness there was nothing to counter the crushing saltiness. The bun was a very poor match for the burger. That bun was a very poor match for any burger. 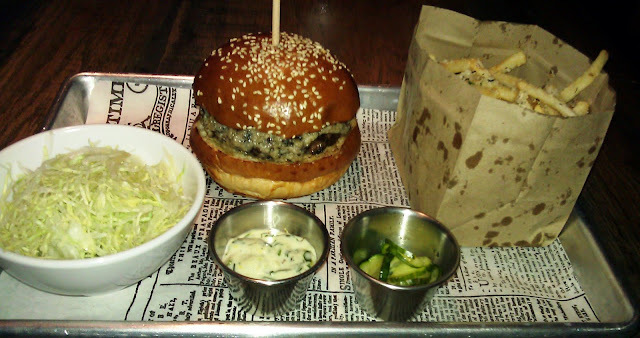 The Meat To Bun Ratio: The dry bun dominated the beef at SmithHouse. The Fries: The peel-off fries were cut in house. They were competently crisped in vegetable oil, and drizzled with truffle oil and dusted with Parmesan cheese. However, the fries were not salted, so that they were oddly bland in comparison to the overly salty burger. The fries did have delicious creamy centers, though. The Toppings: The SmithHouse Burger came with very finely shredded Iceberg lettuce. This was an odd choice, since it tasted like nothing, and it developed a mushy texture within seconds of entering the mouth. The pickles, however, were mild, sweet, crisp, and delicious. The burger came with an herb aioli, which was relatively sweet. I just couldn't justify smearing even more fat onto oily burger and oily bun. The Value: The SmithHouse Burger was $14. This was a burger that I found difficult to get past the 25% mark. I ate half, but that was a stretch. I was uncomfortable during the drive home as a result of eating even that much. The signature SmithHouse Burger was likely the chef's idea of taking a burger to an 11, but it simply took a lot of good elements and amplified each of them to the point where they were each overwhelming in their own right and at the same time. I brought back half of my burger to the office for Fat Bruce Lee to sample. He was actually on a diet, so he tore into the burger. He took a reckless and gluttonous 1/4 burger bite, and he regretted it almost instantly. He was really taken aback by the sweetness, dryness, and mealiness of the bun. He too found the salt and char to be over the top and unpleasant. He threw the second half away..I repeat...Fat Bruce Lee did not finish even half of this burger. This was truly unfortunate--SmithHouse was within walking distance of our world headquarters, and it would have been nice to have a truly excellent burger so close. Burger Review : Far too much of a many, ordinarily, good things were combined into a sub-par burger at SmithHouse Tap & Grill.